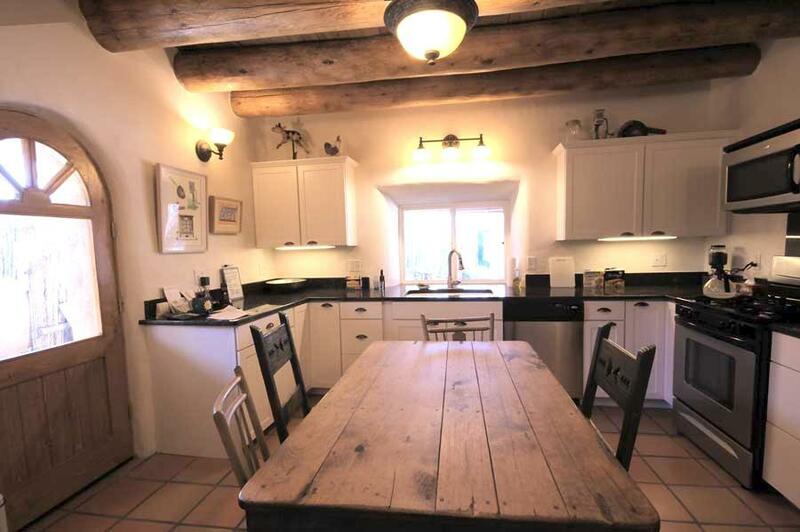 Experience the quintessential Taos authentic adobe compound, consisting of a total of 4 bedrooms, 3 bathrooms, 2 kitchens, including a separate casita rental living space upstairs, approximately 2,024 sq ft. of interior living space. - This enclave is a perfect investment opportunity for full time or vacation living, excellent location for vacation rental or investment property rental. Several of the rooms in the main house open to the portals with exterior doors and would make an excellent home office or art studio. Ample parking is provided for residents and their guests. Live in one, rent the other or use as a home office, guest house or art studio, the options are flexible and endless! Property has a great rental history. - The main dwelling is a charming 1,574 sq.ft. single story territorial style home with 18 thick walls and traces its history to about 100+ years old. Well maintained and lovingly remodeled with modern conveniences, this property possess the following features: city water & sewer, natural gas, granite countertops, stacked washer/dryer, thermopane windows, washer/dryer, multiple skylights, forced air heat, gaslog Jtul stove for additional comfort and ambiance. Diamond plaster walls throughout, with nichos, vigas /wood ceilings, Saltillo tile, wood plank & stone floors, custom arched wood doors, antique style lighting fixtures, and eat-in country kitchen where culinary delights will create memorable experiences. - Southwest ambiance abounds as you dine al fresco in the 563 sq.ft. 15 deep recessed portal (covered patio with skylight) adjacent to a water feature "stream with the seasonal sound of a flowing acequia, setting the mood in this peaceful oasis, complete with mature landscaping in a serene natural garden setting. Separate fenced outdoor spaces include an additional south facing portal with yard, a north side portal at the entrance of the home, and an east side yard with a storage shed, useful for gardening or recreational equipment and is included. There are plenty of possibilities to customize this landscape by adding a greenhouse, small orchard, vegetable/flower garden, childrens play area or simply enjoy the graciousness of this very adaptable bucolic setting. - The delightful 450 sq.ft. casita apartment is located over part of the main home with its own private exterior stair access with a pleasant 218 sq.ft. viewing deck overlooking the treetops and the lovely Ranchos pastures, where you can peacefully enjoy a glass of wine as the sun sets or a cup of coffee as the sun rises. 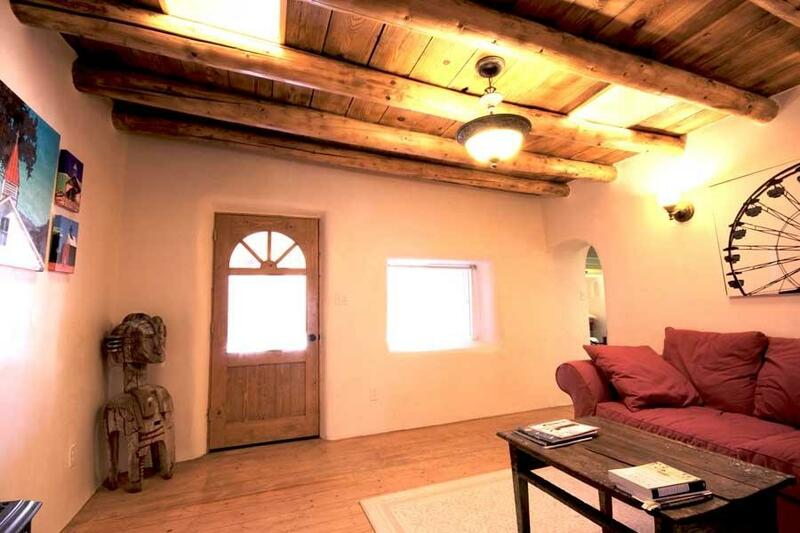 Rent the self-contained romantic attic casita or use as a personal guest space or office/studio. Amenities include: covered parking, gas-log heat stove, wood plank floors, cozy kitchen, stacked washer/dryer, large skylights, new porcelain fixtures, a sit-in tub with shower, wainscoting and plenty of charm. - This quiet neighborhood compound is conveniently located within walking distance to Ranchos de Taos historic district, close with shops, restaurants and is rich in history. Just 4 miles north to the town of Taos, there are more restaurants, shops, galleries, museums, 15 minutes to Taos Pueblo, 25 minutes to Taos Ski Valley, 5 minutes to the Taos country club & golf course, 15 minutes to the Gorge on back roads, this enclave is also convenient to traveling south to Santa Fe & beyond. 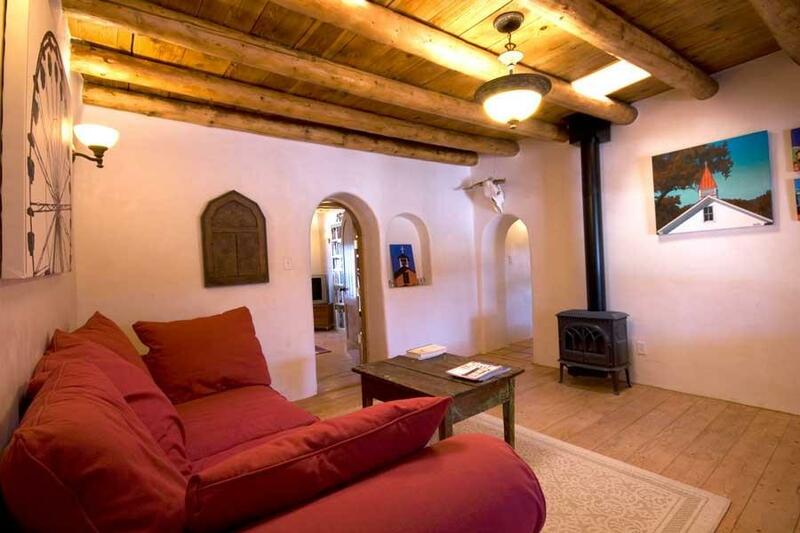 Start living your dream now while owning a piece of history with this affordable quintessential Taos adobe compound in the land of enchantment. 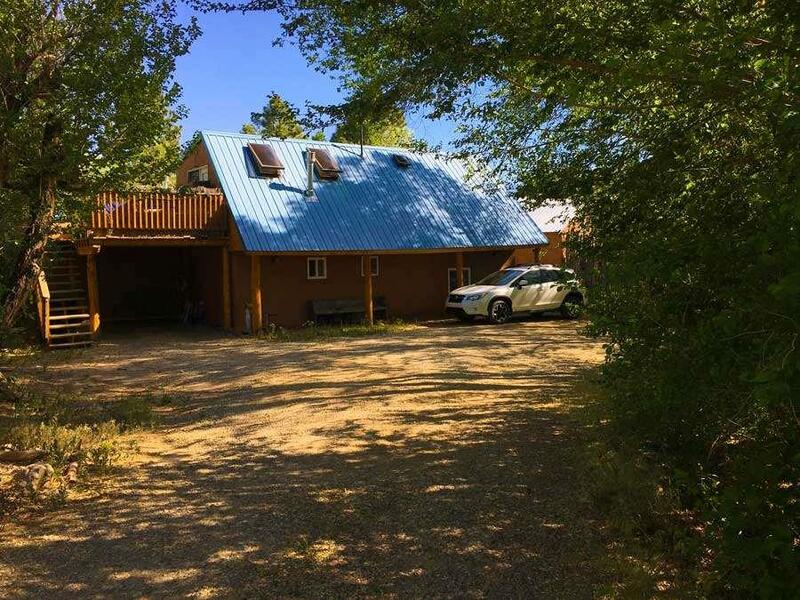 Listing provided courtesy of Kachina Mountain Realty: 505-603-9300.